Offering reliable & trustworthy services by private investigator in Austria! Trust us and create strategy together! Welcome to Austria Private Investigators - Agency Xtrace, a registered company for private investigation and detective services, is looking after entire security operations which are mainly desired by many corporate and organizations located in various parts of Austria and Vienna. Agency Xtrace, has emerged as the one of the dominating source for wide variety of private investigations and other security activities as demanded by organizations to effectively overcome the primary issues of clients mainly related with business issues and personal problems. The brought out reason for the higher rise of risks in the organizations could be ineffective policies and poor standard of processes with lack of confidence and motivation. All these deficiencies accounts to improper functioning and less reliable, unfriendly and non cooperative environment where there are less prospects of development and growth. Under such circumstances, it is highly needed by the organizations to use the services of dedicated and intelligent professions who can take up guarantee for the better outcomes. Due to this reason, organizations found the effective use of investigative and detective processes offered by Agency Xtrace. This is due to the great achievements and impressive records obtained by our investigative firms in providing the consistent solution of numerous difficult problems and making the organizations to note the importance and values of private investigators who are having an attempt to satisfy the endless quests for having the quality private investigation services in entire region of Austria. This is basically done up by our motivated and self guided professional private investigators that are readily available to conduct the quality private investigations across Austria. As an effect, people across the region has shown the inclination toward the use to investigations/detective services and getting the assurance for the positive results and well desired solution of a problem. Our credibility can be gauged by the optimum and extensive use of our premium private investigation services which are having the role to resolve all kind of problems of international and domestic clients according to their requirement. Today we are capable of providing the best processes for majority of reasons. We have got the great recognition due to our specialization in counter intelligence, corporate investigations, private surveillance and also executive protection which are chiefly catered to the clients in various parts of Austria and Vienna. Our private investigation services are having the quality to deliver the excellent searches records on many criminal and civil cases. We are experienced to undertake the stalking problems and tracing the missing persons. Our executive protection services are added advantage of our processes which are offered to the VIP, VVIP and other business person for getting the extended protection at all the times. Our private investigations in Austria and Vienna are meant for providing the safeguard against all the menaces due to loss of interest in personal and professional activities. Our private investigator are capable of providing the extensive investigations in each and every part of Austria including Vienna, Graz, Linz, Salzburg, Innsbruck, Klagenfurt, Eisenstadt, St. Pölten, Mödling, Baden, Wr. 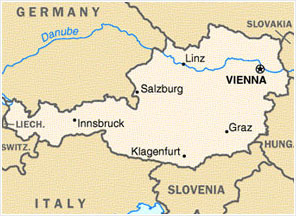 Neustadt and Bregenz. Our investigations are meant for bring the better results in the highly confidential manner and for getting the further information on our services, please contact us on info@austriaprivateinvestigators.com with your requirement respectively.